MaCorny and Cheese pictured with oven-barbecued chicken and Texas caviar. 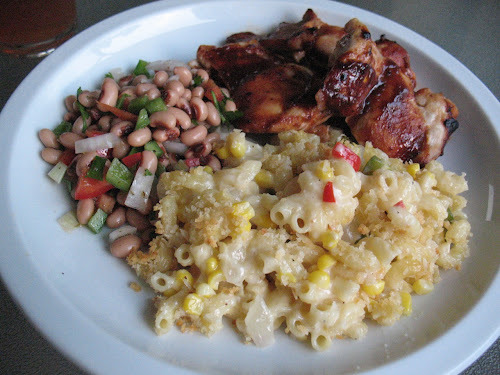 Corn pudding and macaroni and cheese are both wonderfully rich sides perfect for serving with backyard barbecue. 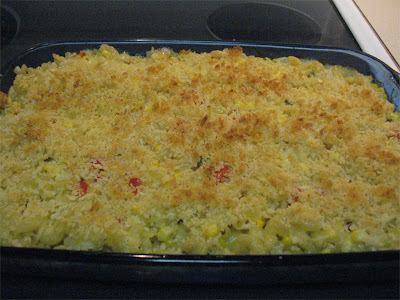 They share some similarities too: both are baked with a milk and cheese sauce to make a firm casserole. I thought it could be interesting to try to combine them somehow. A culinary "mash up," if you will. I consulted with the Washington Post Food section staff during one of their recent chats. Jane Touzalin suggested that I simmer the milk with corn to enhance the dish's corn flavor. She also suggested adding bell pepper. Both of these turned out to be successful additions, giving the dish a heightened corn flavor and a nice vegetal undertone. 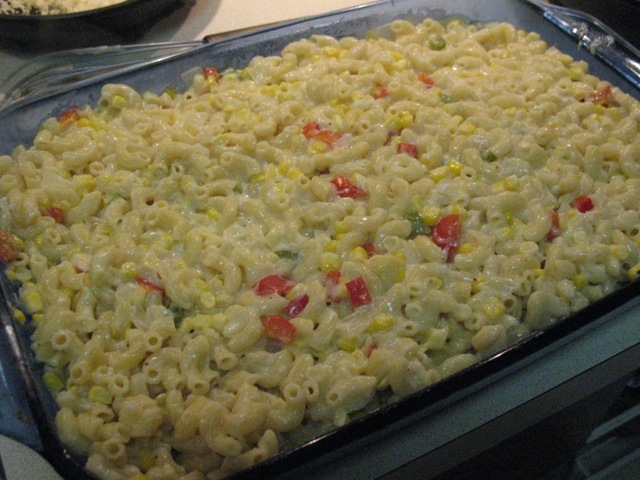 This dish is made mostly like traditional macaroni and cheese. 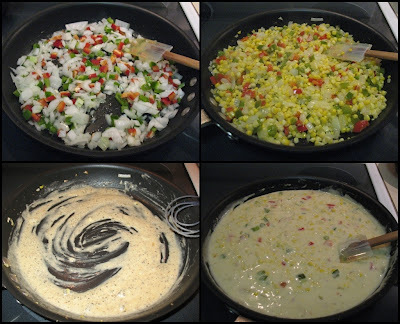 While the milk and corn simmer, the vegetables are sautéed, then removed from the pan to make the cheese sauce (for those who like French cooking terms, start with roux, then turn it into bechamel, and finally mornay sauce). For the cheese, I wanted to strike a careful balance between making it satisfyingly cheesy without overwhelming the corn. I settled on a mixture of mostly fontina with some sharp cheddar, which worked great. 1. Preheat oven to 375 F. Position oven rack about 5 inches from broiler. 2. In a medium saucepan with a lid, add milk and kernels from one ear of corn plus the two cob halves. Cover, bring to boil (watch to avoid boiling over), reduce heat to low and simmer 10 minutes. Discard cobs and strain out kernels (reserve the kernels for later). Set aside the corn-flavored milk. 3. In a small frying pan, heat 1 tbsp. butter over medium-low heat. Add panko and stir to coat evenly. Toast for a few minutes and remove from heat before panko starts to brown. 4. Cook macaroni in boiling salted water according to package directions 1 minute short of al dente (pasta will continue cooking later in the oven). Drain and set aside. 5. In a large frying pan, heat 2 tbsp. butter over medium heat. Add onion and red and green bell pepper and sauté about 8-10 minutes until softened. Add corn kernels and continue cooking another 5 minutes. Season with seasoning salt and pepper. Remove from pan. 6. Add remaining 2 tbsp. butter and 2 tbsp. four to large frying pan. Cook over medium heat, whisking until the roux starts to brown. Season with seasoned salt (lightly), fresh-ground black pepper and a dash of nutmeg. Whisk in the 2 cups of corn-flavored milk, continuing to cook as the sauce thickens. Add the cheese in batches and stir as it melts. 7. Combine the pasta, cooked vegetables and cheese sauce and pour into a 9 x 13 baking dish. Sprinkle the panko on top and bake for 20 minutes. Turn on the broiler and broil until the panko browns, about a minute (watch carefully to avoid burning). Allow to cool a bit before serving. I'm a big fan of your macaroni and cheese, which is pretty much perfect, but this is a alternative for folks looking to throw a barbecue with a twist. Good job. Salmon with Tomatoes and Zucchini "Spaghetti"